Some of the best business class fares to be found both to Asia-Pacific and less often America are from Scandinavia. 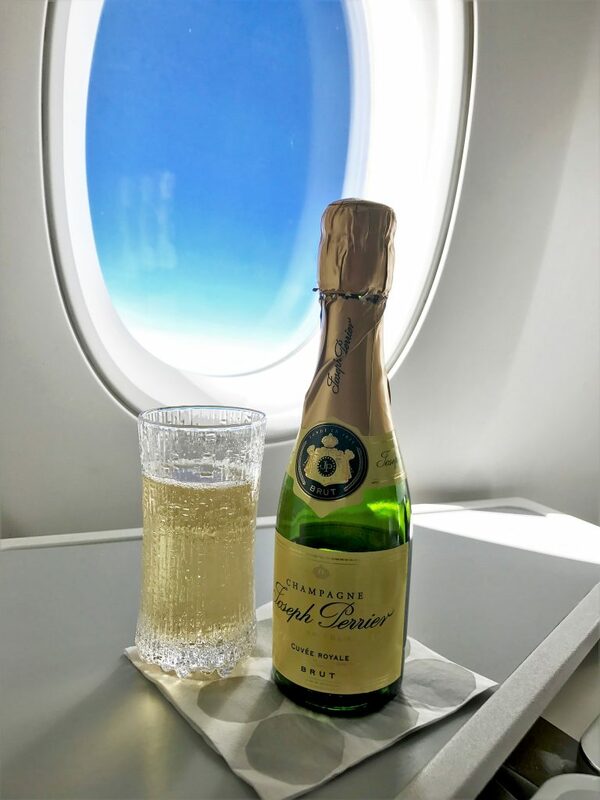 This article will look at what are the best deals usually, where to stay, what lounges the airlines use and how to get around the airport. The first thing to think about on an ex EU itinerary is contingency. 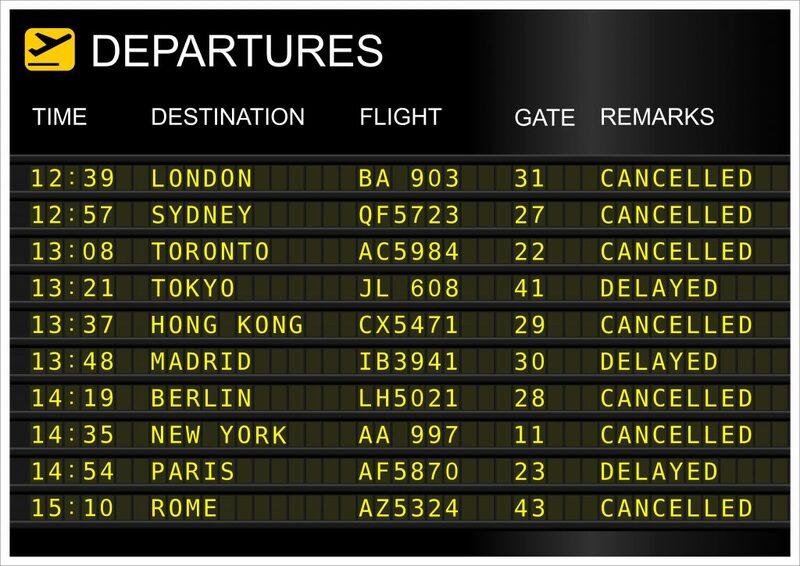 What happens if your positioning flight is delayed or worse cancelled? I nearly always try to take the second last flight of the day out to Scandinavia/Helsinki the night before my main flights. As you are on separate tickets if something went wrong with the positioning flight then you would lose the entire Ex EU ticket if you didn’t make it and have no recourse from the initial airline either. I also always have a look at what other airlines I could fly on if something went wrong and have also purchased a fully refundable ticket for another airline as a back-up. If your flight is cancelled it would take quite a while to get your bags back and out of the airport to another terminal so that is worth factoring in as well. As these airports are over 2 hours flying time away there are only a fairly limited number of flights a day, unlike Amsterdam or Paris where you would have lots of options with very frequent departure intervals. You can read more about ex EU fares in my Beginners guide to Ex EU fares. What are the best business class fares from Scandinavia & Helsinki? Arlanda is quite an old airport and the layout is rather odd over various levels. If you walk between the terminal you will need to go up and down levels and finding the lifts is not always easy as they often aren’t signposted as being for the next terminal, just for the train! Given the weather in Stockholm though, fortunately, all the terminals are linked together in one building so you don’t have to venture outside at all. BA arrive and depart from Terminal 2 whereas Singapore and Qatar depart from Terminal 5 which is at least a 10-15 minute walk so allow plenty of time. The SkyCity area is where the hotels are which is handy for connecting onto Qatar and Singapore as it is only a few minutes walk from the hotels. SkyCity also has some shops and restaurants. 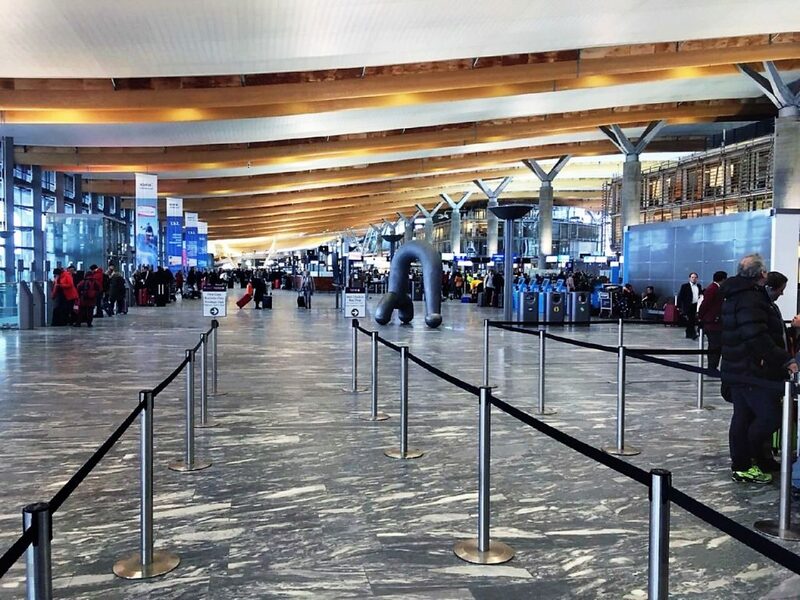 You can find the Arlanda airport website here. 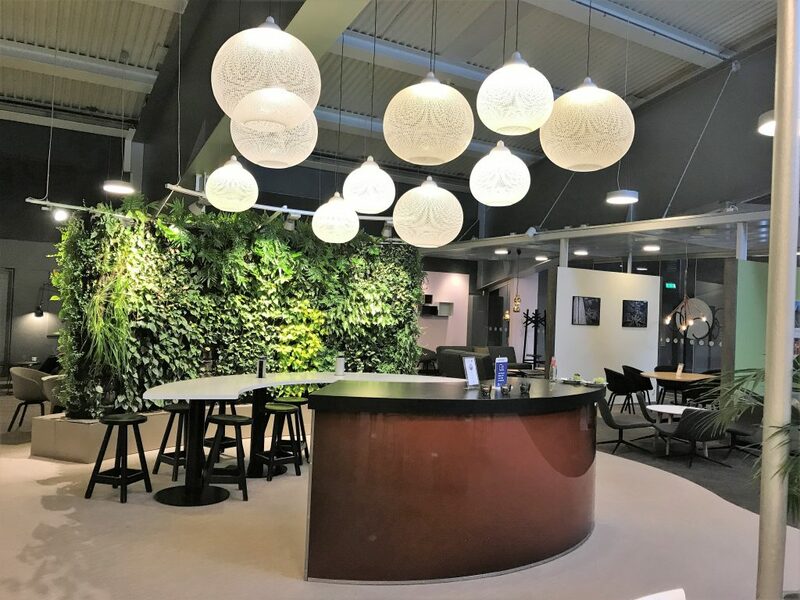 Stockholm airport is a very easy place to spend the night and if you are lucky you can find a hotel under £100 on occasion. Usually, prices are more like £140 a night for both the Radisson or the Clarion. Both of these hotels are within the hotel complex in the SkyCity area almost next to each other. I have stayed here twice and although it is not as luxurious as the Radisson, I have always enjoyed my stays here. In the summer there is even a swimming pool on the roof. The bathrooms are somewhat functional looking but have everything you need including Rituals toiletries. There are sockets by the bed which is essential as I am always paranoid about oversleeping and have several devices plugged in with the alarm set! 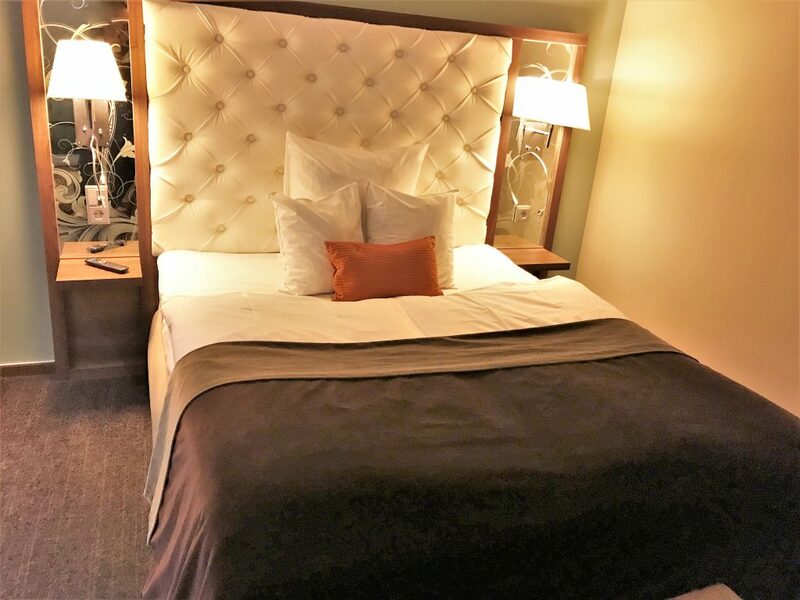 There is a Hilding bed which is very comfortable and the rooms are quiet. Mine had a good view of the ATC Tower. There are also tea and coffee-making facilities which are always a must for an early start! Breakfast is included and has a great selection of local specialities and the usual breakfast choices. I have stayed there for as little as £85 before but on the last visit I paid around £130. 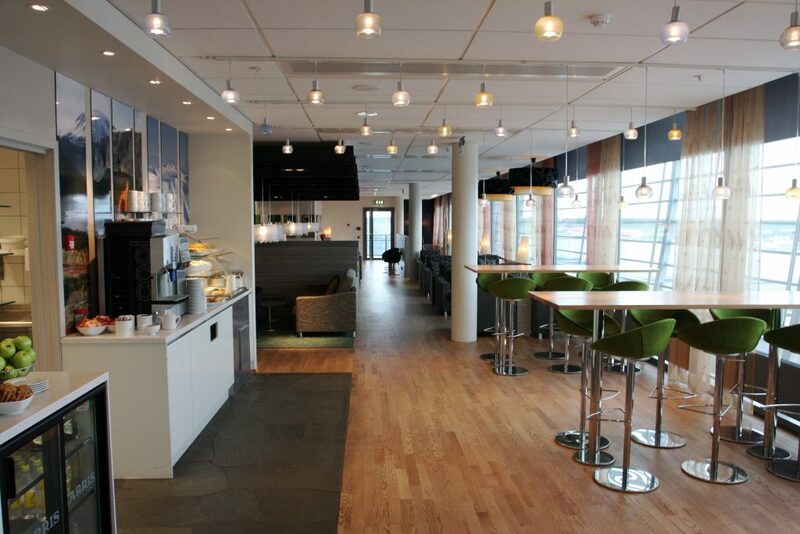 You can find the latest prices and more information on the Clarion Arlanda hotel here. Roving Reporter stayed here when we went to Singapore recently as he is a Club Carlson Gold member. This entitled him to 20% off food and drinks which was just as well as a small beer was nearly £10 in the hotel bar! He was also given a Business Class room which had a nice marble bathroom with bath, bathrobes and a Nespresso coffee machine. 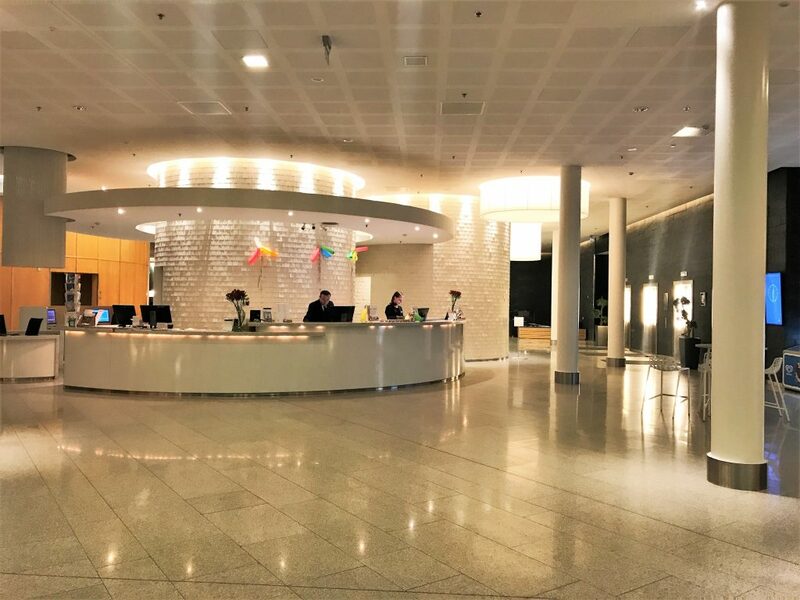 You can find the latest prices and more information on the Radisson Blu Arlanda hotel here. The lounge is located in Terminal 2 near Gates 61-72. This lounge has a typical Scandinavian feel to it complete with antler chandeliers! There are a few sofas at the far end if you want somewhere to snooze after a long flight. Like most of the lounges, it is perfectly adequate but not very exciting. Drinks include wine on tap (never a good sign in my opinion) and beer. It can get quite crowded at busy times in the late afternoon. There is a good enough range of food for a snack meal with some hot options. This is another 3rd party lounge which whilst pleasant is not worth getting to early. It is located in Terminal 5 / Concourse F / beyond Passport Control on the 4th Floor. There is red, white and some pretty bad sparkling wine available along with beer. The food is slightly basic and a bit random with salads at breakfast time. It is light and airy with floor to ceiling windows. It has never been crowded when I have visited when flying Qatar or Singapore. Oslo is also a small relatively small airport and easy to get around. There are only 2 parts to the terminal, domestic and international. There is free wi-fi for two hours in the terminal. No 10 on the map is the OSL lounge. 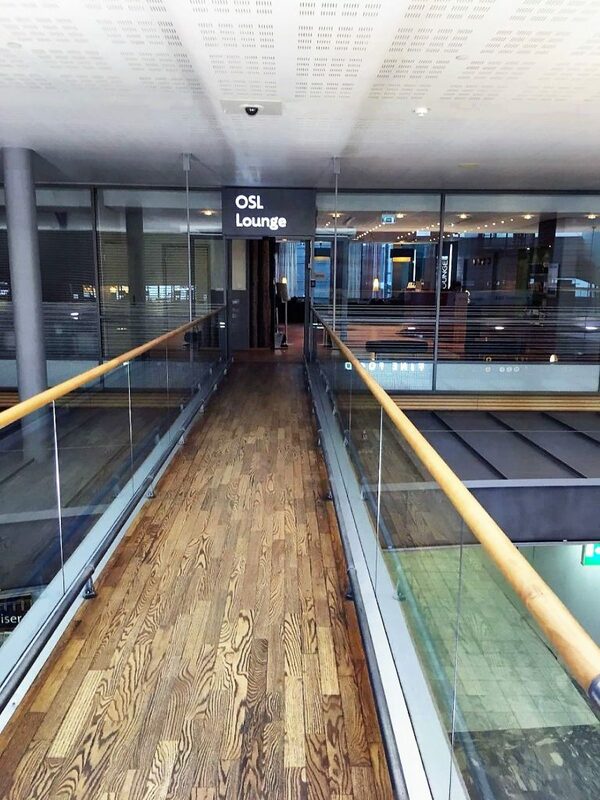 Roving Reporter stayed at the Radisson Blu Airport Hotel, Oslo which is reached from the terminal by a covered walkway. It is about 100m from the terminal so it takes less than 5 minutes to get there. The rooms are soundproofed and there is also a gym as well as a sauna naturally! Roving Reporter had a huge room which well equipped and had good views over the airfield. There was an in-room Espresso machine, bathrobe slippers and a large living area. The shower was over the bath. Prices start around £120. 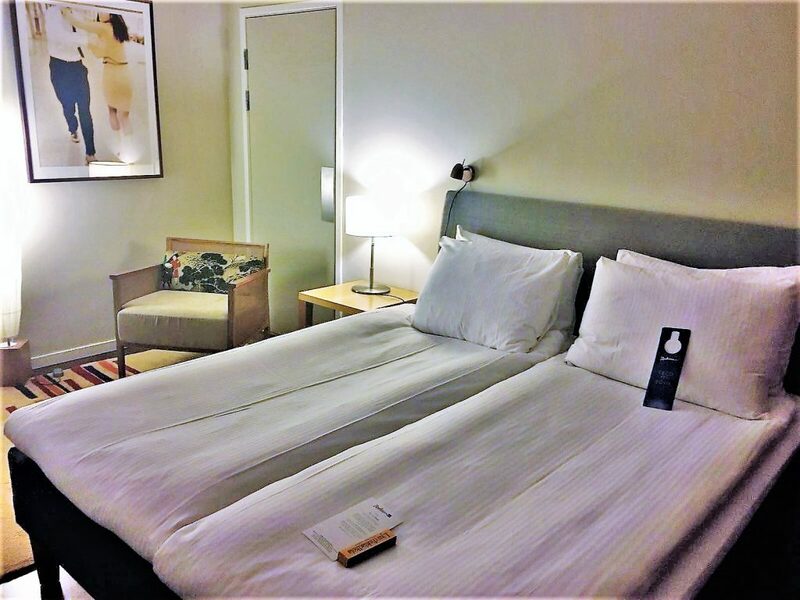 You can find the latest prices for the Radisson Blu Oslo airport and more information here. 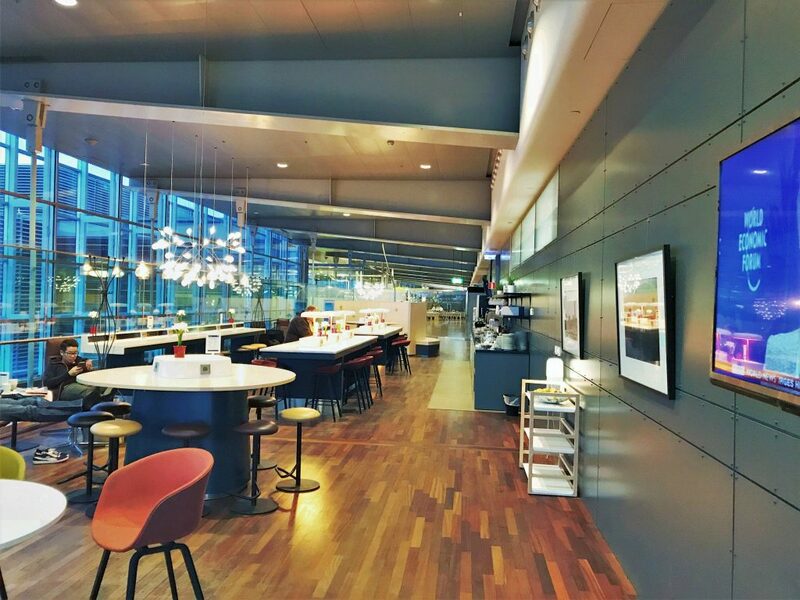 Qatar, BA and Finnair all use the OSL lounge in the main terminal located above the shopping area before gate E8. 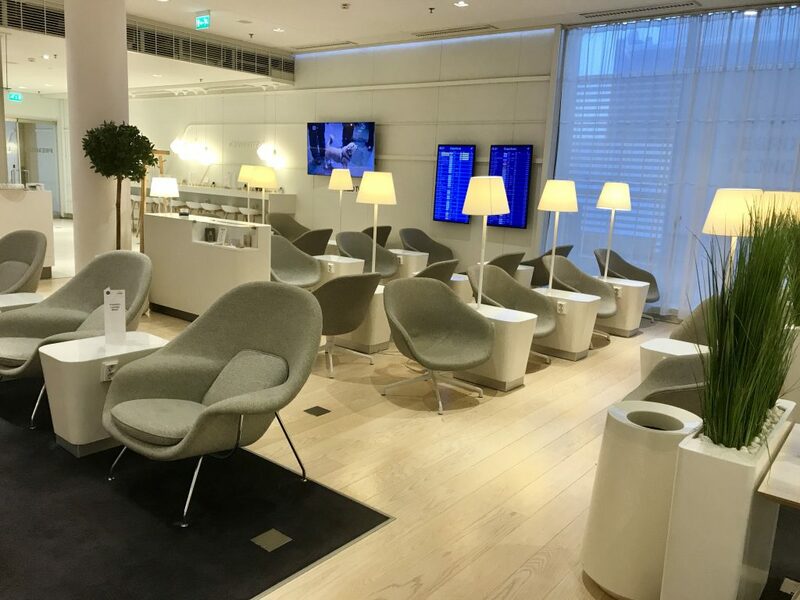 The lounge is before you go through passport control in the non-Schengen area so allow at least 10 minutes extra to get to the gate from the lounge. 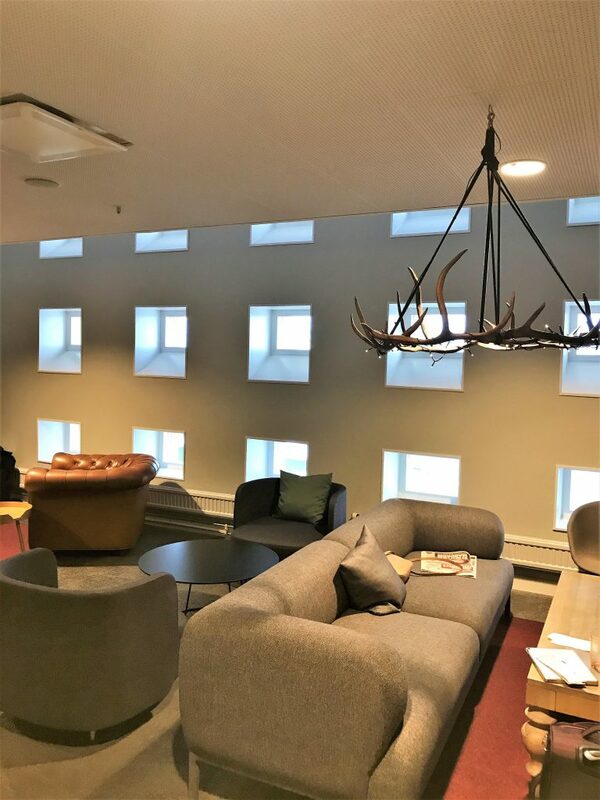 The lounge had a make-over a few years ago and now looks modern with some lovely Nordic design features. There is a small range of food and drink but not worth getting there too early for. The food is all cold and mainly sandwiches, cold meats and cheeses. To drink there is wine (on tap), beer, cava or Prosecco, and some spirits. 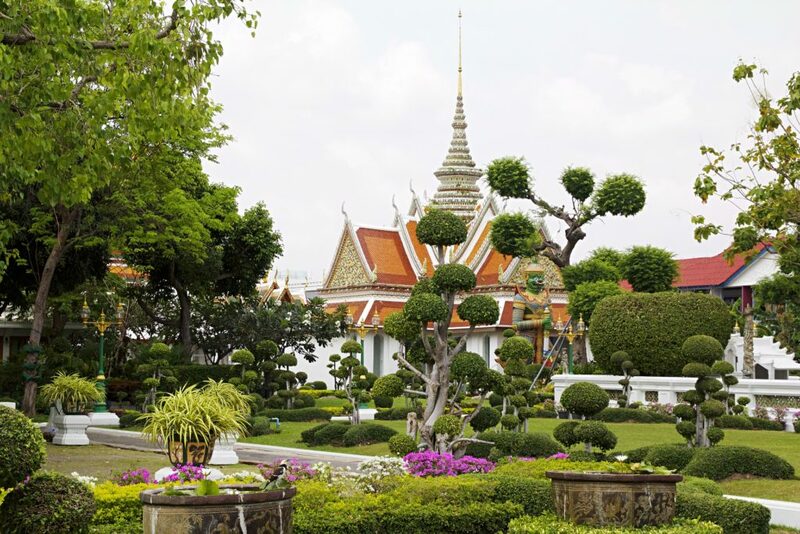 There is also a separate area for First class and oneworld Emerald/BA Gold cardholders. 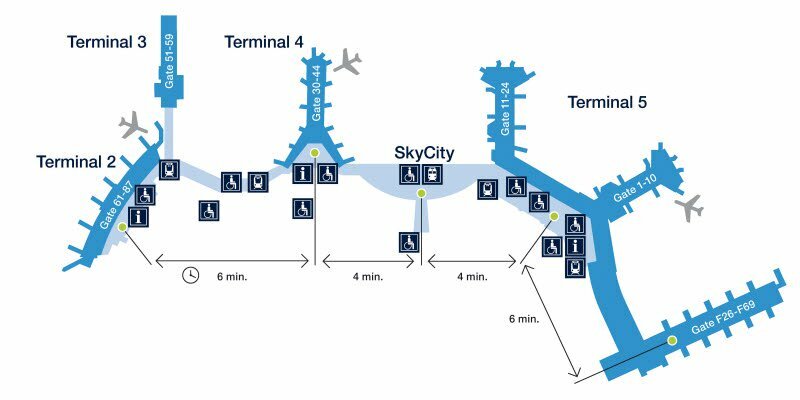 Helsinki only has two terminals which are joined together so it doesn’t take too long to get anywhere. It has a modern feel in the main non-Schengen area and I enjoy flying through there. If you like the Finnair Iittala glassware you can pick them up in the shops in the terminals. You will need to go through passport control to get the non-Schengen gates where BA, Qatar and Singapore fly from. 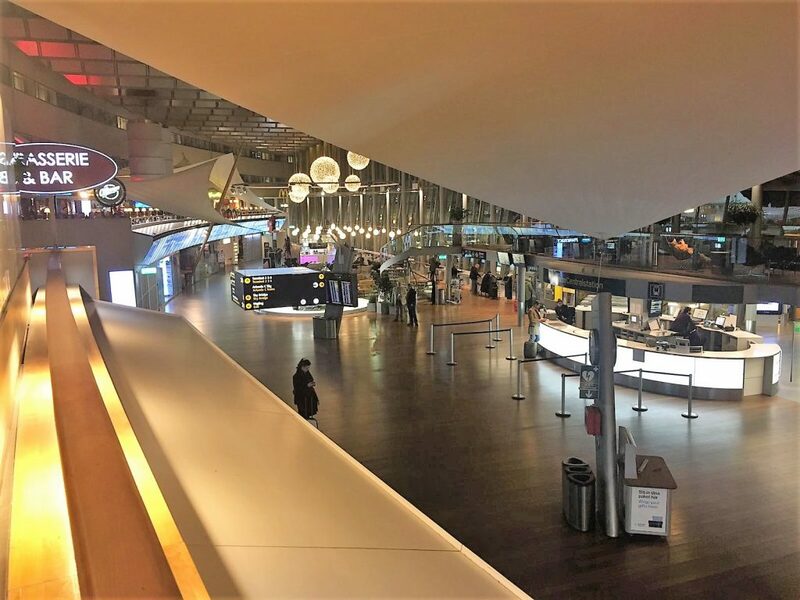 Once through the control point, there are plenty of shops, restaurants and lounges to keep you occupied. You can find more details on the Helsinki Airport website. 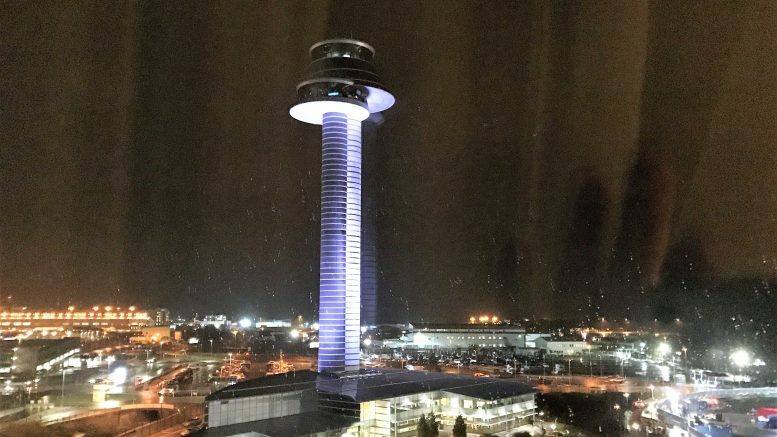 I stayed at the Hilton Hotel which is a short walk from the terminal. It was well signposted but it was a slightly unnerving walk in the dark late at night across the car park which seemed deserted. 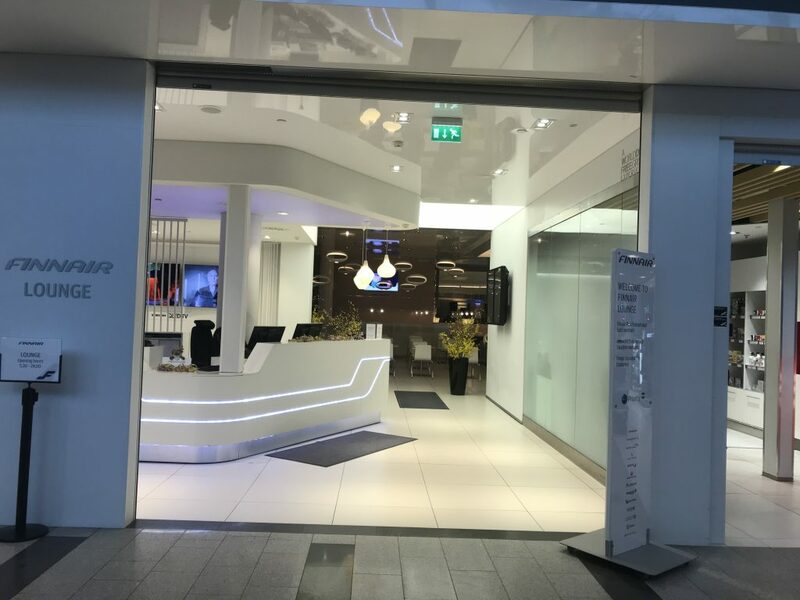 I was greeted warmly at the check-in desk as a Diamond member and everything was explained such as breakfast and the opening times for the bars and restaurants. I liked the quirky reception area with its tree trunks. The room itself was fairly standard Hilton design with light wood and white bedding. The bed was not as hard as some Hilton beds and the room was very quiet. The room had everything I needed including tea and coffee and a separate bath and shower. The only thing I wasn’t keen on was the tiny side cubby holes instead of tables by the bed as there wasn’t much room to put stuff but there was a power socket at least. The hotel has a gym, sauna and an Executive lounge. I was up too early to bother with breakfast. You can find more information and get the latest prices for the Hilton Helskinki airport here. 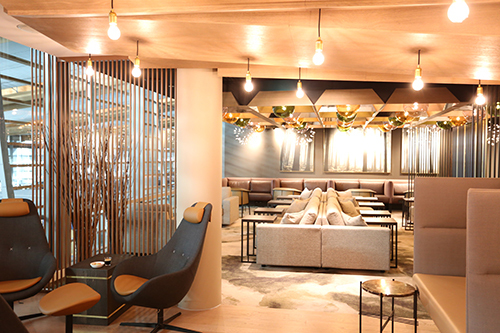 According to the oneworld website the official lounge for Qatar is the Aspire lounge and for BA it is the [email protected] Lounge (also available on Priority Pass). I’m sure I was directed to the Finnair lounge last time but I may not have been listening! I never bother with either of these anyway as I really like the Finnair lounge and one day I may even get round to using the Sauna. The Finnair Lounge (non-Schengen) has two sides. 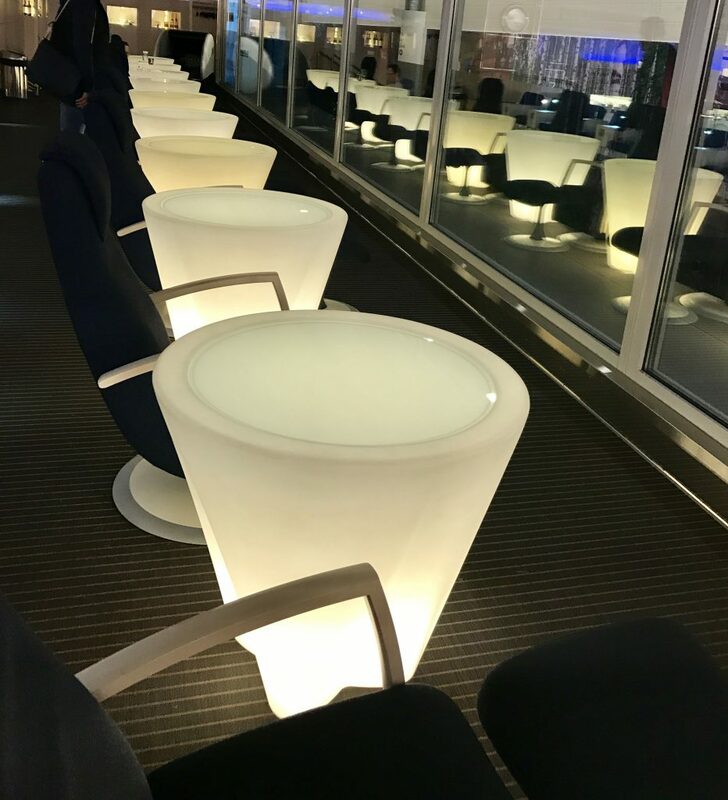 One, the Premium lounge, is for oneworld Emerald/BA Gold etc level card holders which you can access in any class if flying on oneworld. The other is for business class passengers. Both are good lounges. The Premium lounge is very modern in design and contains something of a novelty for an airport lounge, a sauna, as well as showers. There is food to order as well as a small buffet. Champagne is also available from the bar with a range of other wines, beers and spirits. In the business class lounge there is a business centre with Mac computers, a similar range of food to the Premium side and help yourself wine (including sparkling) and draft beers. I was particularly impressed with the sleep pods that would offer privacy and darkness if you fancied a bit of a snooze. 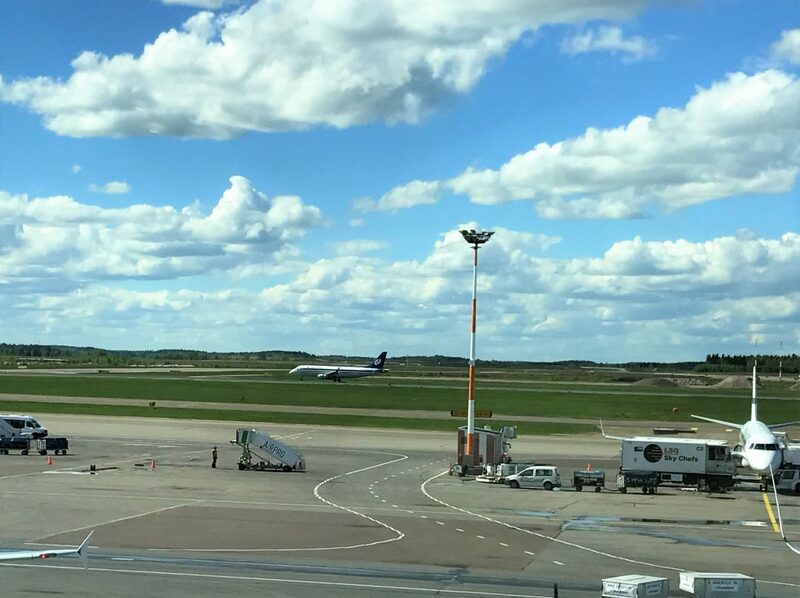 16 Comments on "Beginners guide to flying from Scandinavia & Helsinki – ex EU fares, hotels, lounges and more"
Thanks George. Hope you get to put it to use! 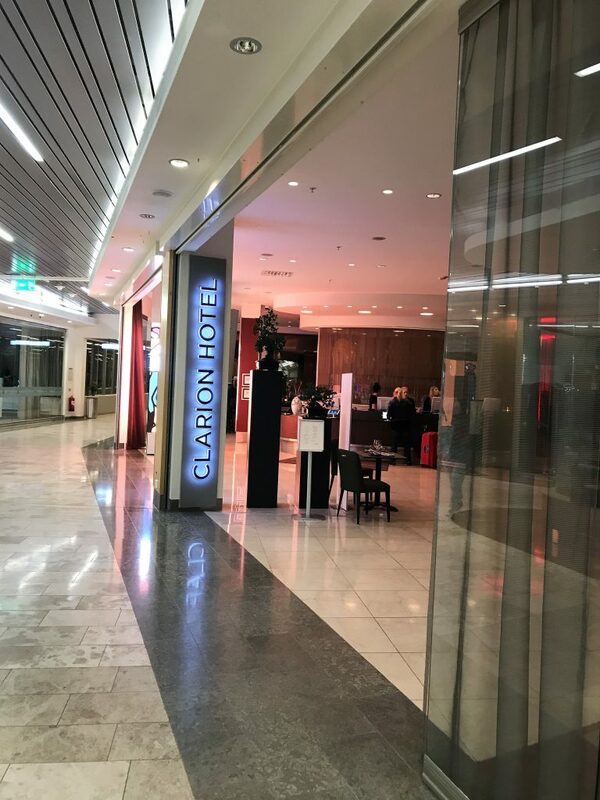 Indeed staying in SkyCity (ARN) is a great option, last month I stayed at Clarion, arrived late in the evening (BA0782), it was a short walk to Terminal 4, most of the shops close very early, but there is a 7eleven in T4 and a few restaurants. The fitness centre is great (but again closes to early, 23pm local time) and breakfast is included. 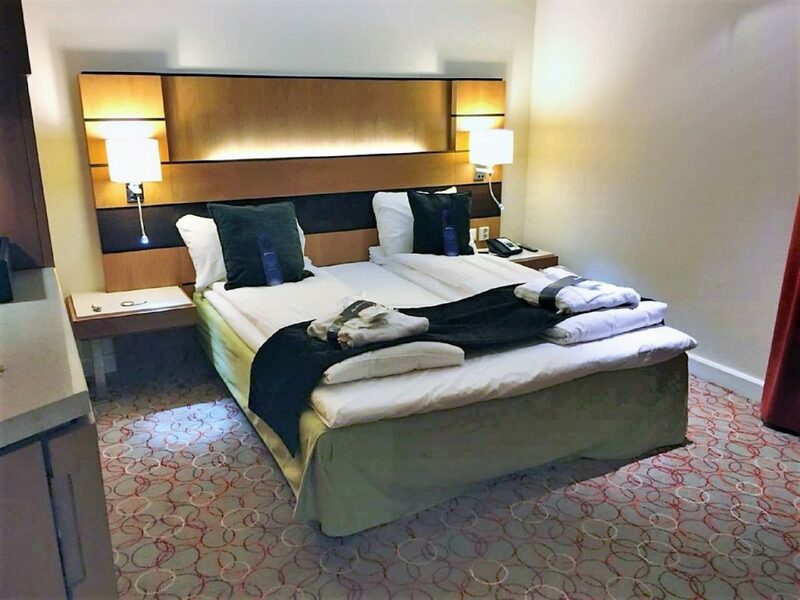 Qatar will soon fly to Portugal, so I guess it is going to be a good option as well, as the city centre is 6€/10 min (Uber) away from the airport or less, as most of the Hotel chains have an underground stop near by (Double-Tree has two). TAP Air Portugal in trying to compete with BA (North America route), it will be interesting to see how it goes. Thanks for the extra info Susana. Yes Portugal could be an interesting option. Bizarre article. You write about Scandinavian, but no mention of SAS or Thai which are two major airlines out of Arlanda and Copenhagen (which wantwa mentioned at all in the article). Also no mention of Emirates that also flies to Arlanda. The article as it is titled is about flying cheap fares from Scandinavia for U.K. based people as in ex EU flights. It is not about flights in general from those airports. Generally flights starting direct from those airports with SAS and Emirates are not particularly cheap. It is also aimed primarily at Avios collectors as that’s what most of my readers collect which means a focus on oneworld airlines. In April, I flew BA and QR, also AY in March. Each time I was taken to the Finnair lounge, so I suppose this is now policy at HEL. I do like the catering options – hot food, wine and draught beer – and they had same day UK and other newspapers. There was a huge amount of building work going on to expand the airport. The small airport I remember is no longer. i was booked at the Hilton but discovered in advance that the walkway was closed for rebuilding. With (hopefully temporary) mobility problems, I cancelled and booked at the Holiday inn Vantaa Airport hotel. 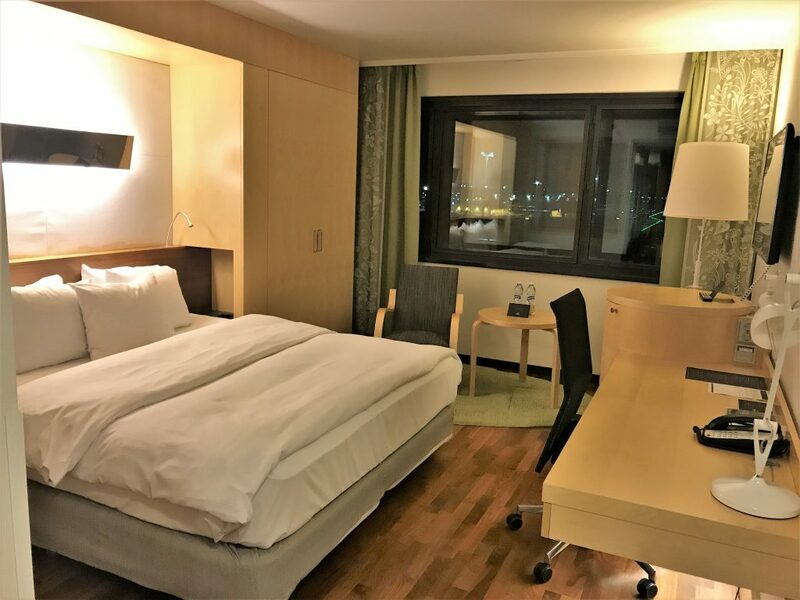 The Holiday Inn is a 10-15 minute bus ride away – shared with another hotel, the Finnair training centre and a couple of other stops. Soon crowded. The hotel is average – good breakfast – but not recommended because of the inconvenient transfer. Another small airport with much rebuilding work going on at the time of my November trip. I hope it’s finished now. At the time, I remember that the gates for BA and QR were a long walk away from the departure lounge. The Oslo lounge was the first lounge I remember that offered Jaffa Cakes? 😀 Yummee. Thanks for the updates Roger. Yes the Hilton Helsinki had some very steep ramps when I was there which were a bit of a struggle with the luggage trolley. Sounds like the oneworld website is incorrect about the lounges for Helsinki then. Sorry, that ‘?’ in the last line should have been a ‘!’. Great article. I’m looking at booking ARN-WLG or ARN-AKL in February 2019 and a corresponding feeder flight from the UK the day before. As this is a winter departure I’m scared that the flight may get cancelled due to snow. 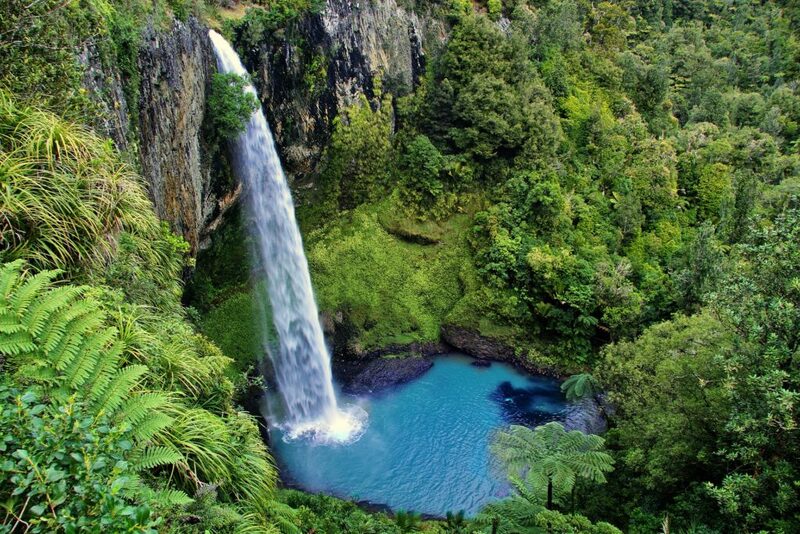 You mention in the article about also booking a fully refundable flight as a back up. Would this be a flight from the UK to the final destination? If so, what is the latest time that you can general cancel? Can you just no show then claim the refund? Hi Tim. We bought a back up ticket for ARN in January partly for that reason. I wouldn’t get one for the final destination as that would be extortionate usually! BA tend to cancel flights more than foreign carriers in those sort of situations. We had SAS tickets which we could just no show in but we cancelled on the day with no issues. You can get tickets that you can no show for and get a refund if they are fully flexible. Just read the t&c carefully! Sorry Michele, I’m still a bit confused. The backup flight was for the same route e.g ARN-AKL, but with a different airline at a later time and/or date, not for a completely different route e.g LHR-AKL? Have you ever reviewed flying out of Gothenburg? Hi Scott. None of the team have done Gothenburg yet. If you would like me to do you a review later in May (heading to the Datai, Langkawi via Sing) of Airport, Lounge and access to the City then let me know – it will give me something to do on the flight.